Sarath Babu's Lifestyle Blog Book Reviews Book Review - Second Chances : Will you give love, life and happiness a second chance? 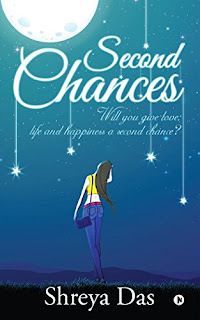 Book Review - Second Chances : Will you give love, life and happiness a second chance? Title - Second Chances: Will you give love, life and happiness a second chance? A simple yet a beautiful story revolving around two characters. A different plot altogether is what I would say where a ghost (Sameera) was assigned by the GOD to play as the cupid angel to unite Roshni and Karan. While Karan was happily employed with a women magazine as a Phtographer(now you know why I did say that), Roshni had a sad past. She had lost her husband Rahul, in a tragic car accident. However she had two good friend Annie and Glen. Glen was shunted out from his house since he proclaimed himself as a gay. Sameera takes up the hard job. She haunts Roshni and make her change her attitude towards fashion. The story also has few other characters like Roshni's & Karan's parents. I don't think anyone could pen it down with so much of love, warmth capturing all the emotions in a subtle manner. Do give a read. I bet you would finish it in one go.